"Gion Kobu Kabukai," or the preservation society for Gion Kobu Dance, in Higashiyama Ward, Kyoto, has adopted audio devices with earphones for foreigners for the dance performance "Miyako Odori" held from April 1 to 30. The program is explained via an English audio guide. 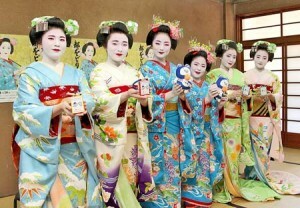 Maiko, or apprentice geishas, promoted the devices as they held them in their hands. This introduction is in response to the rapidly increasing number of foreign tourists. The simultaneous English explanation tailored to the performance's progression has commentary on the story lines and highlights. Not only lyrics, but also the history, background and dance movements of Miyako Odori can be understood. The service costs 500 yen plus a deposit of 1,000 yen which will be refunded when the device is returned. For more information, call Gion Kobu Kabukai at 075-541-3391.